I got excited the moment I read a friend’s blog on this place called Thirumalpur. She claimed that it was a must-visit place for any ancient-temple-lover. That hooked me on and within four days I had made my plans: my cousin and I were to visit this temple on a bike! 2) I would be taking my new Sony DSC H3 along! I had got the cam 2 full weeks back and had not experimented much with it. And this trip seemed to be a God-send! After an hour’s drive, we finally reached the outskirts of Kanchipuram. Wishing to know the way to the inskirts.. I mean, interior of Thirumalpur, we asked a guy at a bus stop for the route. After answering us to the point, he added pointlessly: “Remember a huge accident happened two days back in which two buses collided head-on leaving scores dead? Well, Thirumalpur is pretty close to the place”. Big help that was. Anyways, it was now that the real fun started. 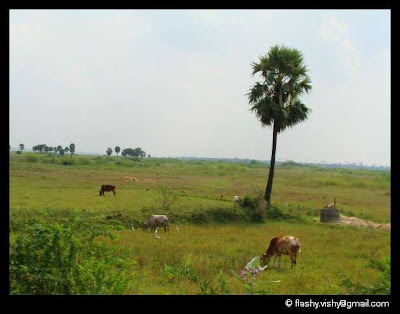 We were traveling on the Kanchipuram – Arakkonam road which reminded me of my native town Tirupattur. Lush green fields accompanied us throughout the route, with a railway track running parallel to the road the entire distance. Seemed like a scene out of a movie. Especially since the sun was being so easy on us: it was one of those cool cloudy-but-no-rain days. Both of us rode on wearing Dhanush-like smiles. And when we had to take a detour to reach the destination, things got even better. The village looked straight out of Asterix. The huts were so small. Like small. And add the characteristic coir-rope cots at the entrances. It was like we had stepped a good twenty years back in time. Grazing cattle and sheep only added to the effect. And there was just one house that had a tractor and a first floor - which we concluded must be Sarath Kumar’s (or Vijayakanth’s). After an invigorating drive through these rustic settings, we finally reached the temple at around 12.45 PM. And stared at the locked door. I've found that the way to Kancheepuram has its own charms :) Waiting eagerly for the update! And ya.. biking on NHs is a risky thing to do..
And ya.. unwinding after CAT :) there is nothin else to do, at least till Jan.. The Gurukal of the temple resides in the house adjoining the temple, very near to the main gate. He is a pretty decent guy and will facilitate your darshan. There are other important temples nearby like Govindavadi Agaram, which is prescribed as a remedy for those afflicted due to transit of Guru. Do you know anything about this temple you didn't get to see ? Sankar is looking for it & I'd like info, too.